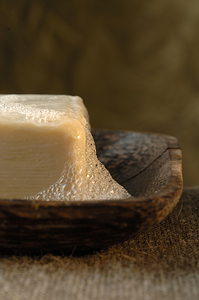 Natural Soap is arguably one of the purest and most perfect gifts of Mother Nature. Here at SpaFetish®, we believe that using a completely natural soap is not only a sign of honor and respect for your body temple – but it is a true vessel for clean and healthy skin. All natural soap is fundamental to good skin health, because it imparts natural oils into the skin and does not dry it out like commercial soaps do. And, we have loaded each of our natural soap bars with the best ingredients and cocooned them in saponified organic oils of Shea, Olive, and Coconut to give your skin a handmade soap that is pure and perfect luxury. Our eco soap is also packed with Vitamins A, C, D & E, along with Echinacea and Goldenseal to heighten the nutrients. Trust us! Our natural soap lends itself well as bath soap or a facial soap -- and either is equally fabulous! In this completely natural soap, Lemongrass pairs beautifully with Shea Butter, while a splash of Lemon zest gives this soap an elegant finish. 4 oz. A gratis shower puff sponge is included. This completely natural soap is drenched in fields of fresh Lavender and pure Lavender essential oil. 4 oz. A gratis shower puff sponge is included. Our Rose Soap is drenched in organic Roses that pairs well with a delicate note of Geranium Essential Oil to render a completely natural soap. 4 oz. A gratis shower puff sponge is included. Our completely natural soap is drenched in Peppermint Essential Oil, while crushed Peppermint Leaves and a delicate note of Black Pepper sure up this trusty bar. 4 oz. A gratis shower puff sponge is included. This is our completely natural soap drenched in Australian Eucalyptus Essential Oil and a delicate whisper of Wintergreen. 4 oz. A gratis shower puff sponge is included. In this completely natural soap, organic Apple Pectin is coupled with assertive notes of crushed Cinnamon Essential Oil. Crushed Apple skins give this soap a delicate red hue. 4 oz. A gratis shower puff sponge is included. This is our completely natural soap encased in Cinnamon Essential Oil and a sprinkling of freshly ground Cinnamon. 4 oz. A gratis shower puff sponge is included. In this completely natural soap, Orange Essential Oil pairs beautifully with refreshing notes of Lime, while Grapefruit adds an elegant zest. 4 oz. A gratis shower puff sponge is included. In this completely natural soap, pure Hibiscus extract and organic Hibiscus petals are balance by a sweet splash of Mandarin Essential Oil. 4 oz. A gratis shower puff sponge is included. In this completely natural soap, organic Coconut Milk, Coconut Oil and crushed Coconuts give way to an ethereal soap that is beyond exquisite. 4 oz. A gratis shower puff sponge is included.